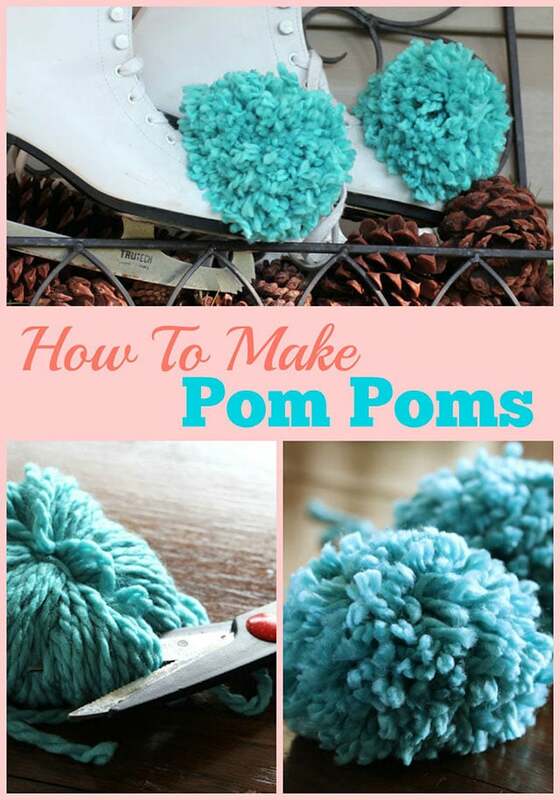 Have you ever wondered how to make pom poms? I mean, you’ve seen them all over Pinterest lately in all sort of home decor and craft projects. 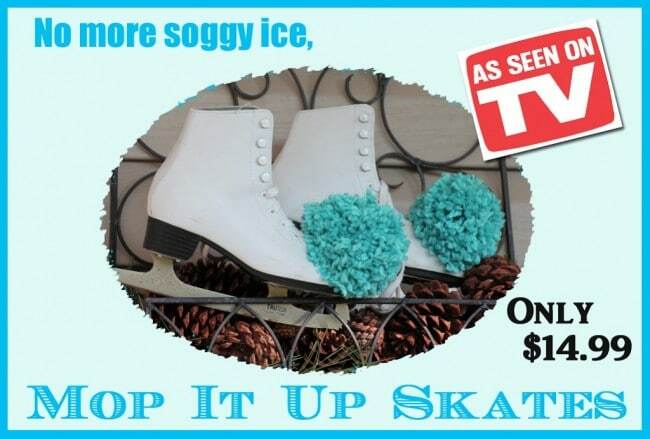 And you probably had some on your ice skates when you were a kid. But do you remember exactly how to make them? Well you’re in luck, because I’m going to refresh your memory and show you how I made these awesome hunks of fluffy pom pom aqua-ness. For some reason the whole how-to-figure-out-the-circumference thing was totally lost in my pre-menopausal brain and they came out a little bigger than I had envisioned. They remind me of those old-school mop heads. You know, for those times when the ice is a little too wet and you don’t have a zamboni around. 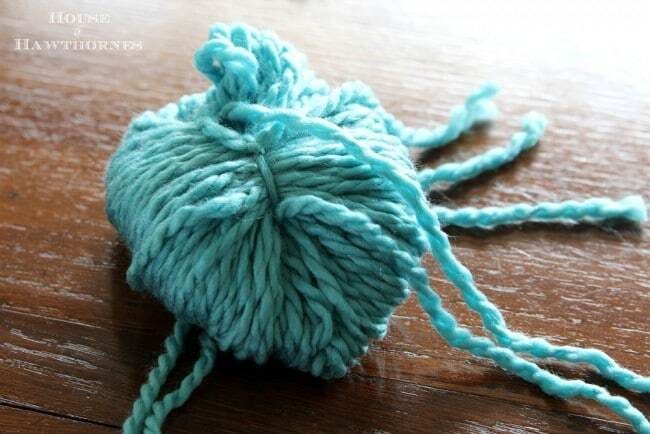 I haven’t made pom poms since I was about ten years old, so in case any of you are of the pre-menopausal variety too and can’t remember back that far, this is how I made mine. 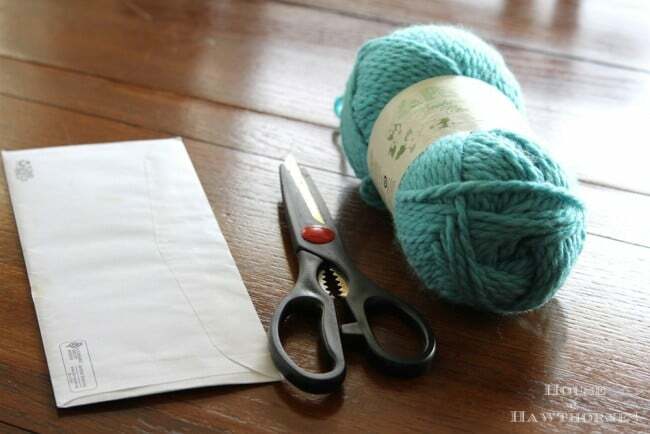 You will need yarn, scissors and something to wrap the yarn around. I used a standard business size envelope that happened to be sitting on my desk (it’s never been opened, so it’s a little stiffer than just an empty envelope). 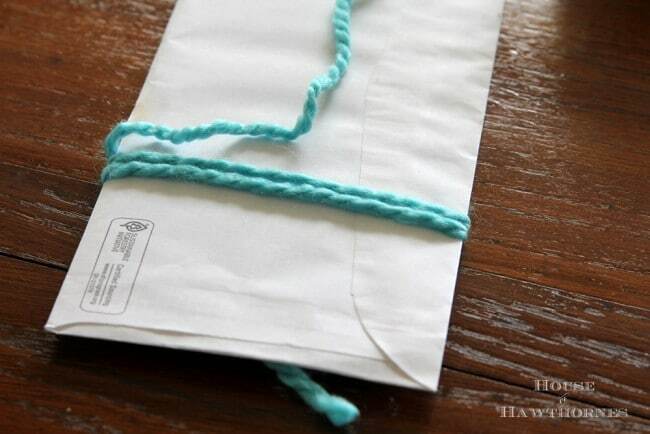 You could also use a large fork, a piece of cardboard or your hand to wind the yarn around. 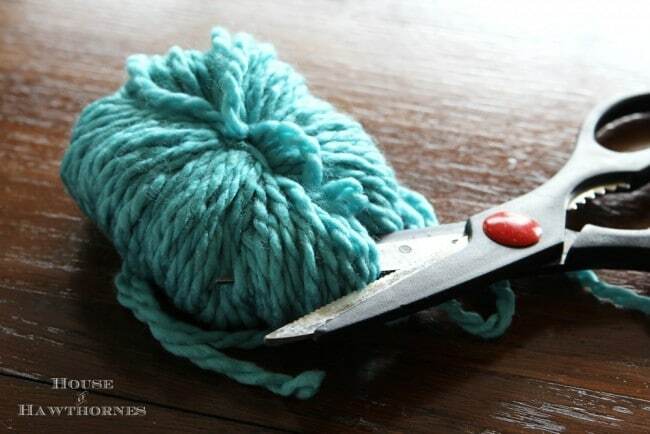 Start by winding the yarn around your item. And then wind some more. 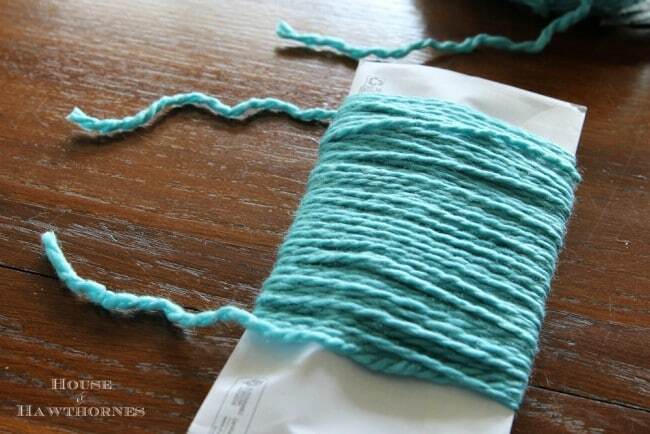 Until you are totally sick and tired of winding yarn. 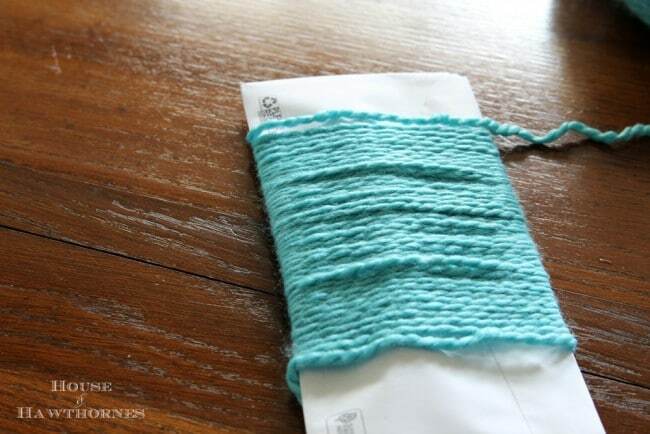 I wound my yarn 100 times around the envelope (going from one point in front clear around to the same point in front – counting as 1 time). This is where my tutorial gets a little confusing, so bear with me. Pre-menopausal, you know. I took another piece of yarn and ran it under the yarn on the one side and then gathered all the pieces of yarn on that side together and tied a knot. I then took another length of yarn and gathered all of the pieces of yarn on the other side together and tied a knot. 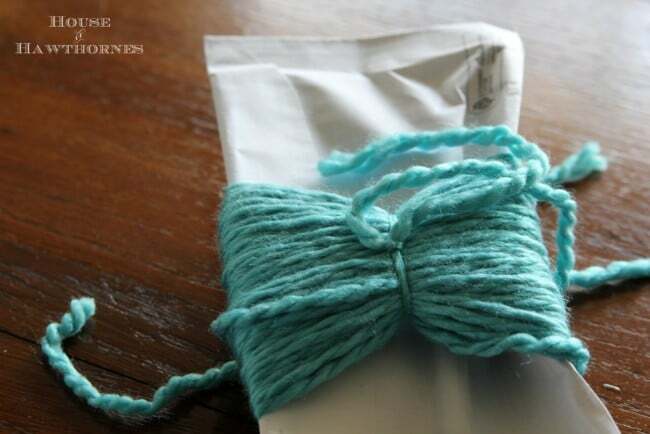 Then slid the yarn off the envelope and wound yet another piece of yarn around both gathers to bring both gathered sides together. You’re going to end up with two sets of loops – one on the right and one on the left, with the middle tied together. Then you just cut the loops. Do a little fluffing and you have some giant pom poms. My envelope was roughly 4″ wide and the pom poms came out to be 4″ wide. Who knew? 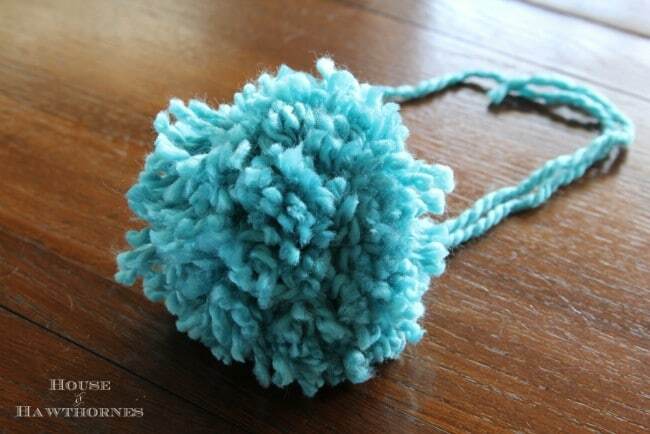 So if you want your pom poms a little more of a normal size and are not going to be mopping anything with them, you should probably use something about 3″ wide to wind it around. If you are making them for skates, you will need two blue balls (hee hee). This just may be a pom pom-less house here. I would be afraid that the weight of those pom poms on your skates would be enough to tip me over. I haven’t skated for years. I love the color…….you are so bad, he he. Love the color and size! 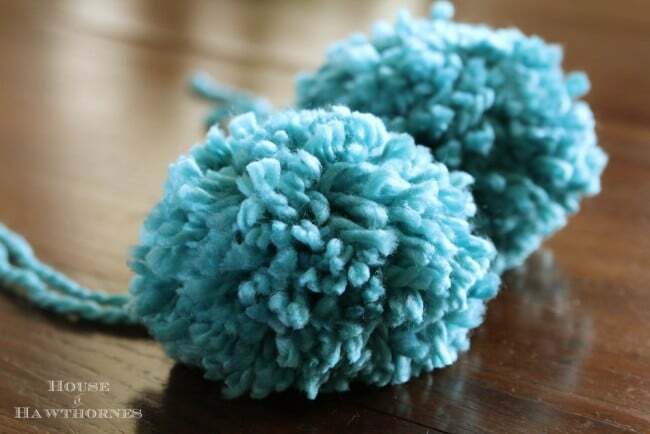 I’ll be joining Jen’s party, too as I’ve recently shared two pom-pom ideas on my blog. You are so funny, Pam! Seriously though…I love the color aqua on skates! That is so funny! Mine turned out the other way. So small they looked like little critters that escaped a fish tank! Your turquoise puffs are the puffiest in the world! Love the intensity of the color…good job pulling it all together! Please help me with my Blogger issue…I’m about to shoot myself. Cant upload any photos. My friends and I used to go roller skating at the local rink almost every weekend. Nope, none of us had a lick of talent, but we had fun anyway. The rink used to sell those pom poms, and we all wanted some, but seems the weeks we had money, the little skate shop wasn’t open. 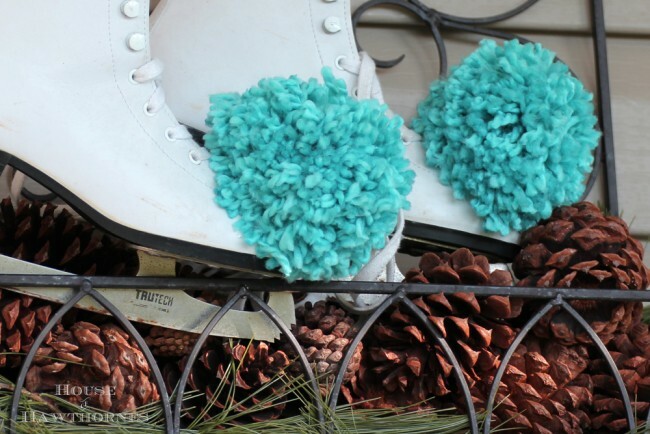 I hadn’t thought about those pom poms in years until I saw them on your skates. I do know the rink we went to finall closed a couple of years ago, but even then I didn’t think about all of us dying for those pom poms for our Strawberry Shortcake skates. Thanks for the trip down memory lane! So cute Pam! My sister told me she just bought a pom pom maker for $7.00…I thought that was cheap, but I knew there was a home made version too. CUTE! You are a hoot, blue balls and all. I love them big! Love your ad, and who cares if the ice gets slushy. I haven’t made any for years, either, but I was just casually looking at yarn at walmart last month and I couldn’t believe the cost! Holy cow! Have no idea when that happened, been years since I crocheted or knitted anything, but all I can say is now I see why everyone is charging an arm and 2 legs for just a goofy scarf that they knitted. Love the color and texture of your yarn. I might have to do something like this soon. Where are you going stick more of these??? Very cute! I remember having some of these on my roller skates! I take the easy way out and use my round plastic pom pom maker. But there’s no way I could make giant ice mops like yours! I think you may be onto something, Pam! Those are a fabulous stand in for a Zamboni!!! Actually, I heart them, from the color to the size they are FUN and remind me of when I was a kid with my mis-matched pompoms on my skates! Too funny! I think they look sweet and I love the aqua color you chose. I look forward to seeing the different ways people used pom-poms. Thanks for sharing. Who knew pom-poms were back…not I!!! This could be a great way to use scraps of yarn…I’ll go check out the party! love them on the skates- super cool! and love the fun color you used! Perfect timing. Looks like I’ll need to be making some pom poms for the ice skates this week. Emma is hosting an end-of-exam ice skating slumber party on Friday night at our house. Dear Lord, I would not dream of attempting a pom pom. Nor can I keep up with these parties. I am a complete failure at these things. Your poms are delightful! I am sharing them on my Facebook page tonight! Grab a “I Was Featured” button from my blog and thank you for linking to Cowgirl Up this week! I had these on my roller skates when I was in Junior high! (Wa-a-a-ay back in the 1960’s!) Mine were black and gold – the school colors. I LOVE that they are on skates! Awesome!! !